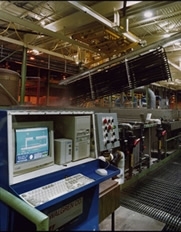 Anodizing The anodic film is built and combined with the metal by passing an electrical current through an acid electrolyte bath in which the aluminum is immersed. The coating thickness and surface characteristics are tightly controlled to meet end product specifications. Sealing This process closes the pores in the anodic film, giving a surface resistant to staining, abrasion, crazing and color degradation.